Our own brand CTND Double Sided Carpet Tape is available in handy 20 metre rolls. It is also 'exhibition centre' approved so ideal for use on display stands or in the main halls. Simply cut into squares and either stick directly to the back of each carpet tile or lay in strips straight on the floor and press the tiles on top. The tiles can be easily re-lifted for cleaning or replacement in the future if required. Our carpet tape is normally used on smaller jobs requiring less than 100 tiles. One of the advantages of using the tape over the liquid form adhesive is the fact that you do not to wait for the adhesive to dry and can start the job straight away. Just hit ‘More Details’ or click on the image below to see more about the product and Add to Cart. There are several new products out there on the market but good old fashioned carpet tape still takes some beating. Its simplicity to use makes it the best alternative to the carpet tile tackifier adhesive for smaller areas. We always recommend and likewise most manufacturers the same, that if you are fitting more than 100 tiles in one area then the low tack liquid adhesive is best. There is a definite advantage not just monetary but also with time. However there is always a time and a place where our double sided carpet tape can be more beneficial. We are always receiving feedback from our customers, a large proportion of which are repeat orders who will happily tell us what product they used when last fitting their carpet tiles. Some customers taking on the laying of their carpet tiles themselves in a DIY capacity feel slightly daunted when faced with ‘gluing’ the tiles down. The liquid form adhesive does require a little more studying of the instructions and experience naturally helps when using this product. The double sided carpet tape negates the need for drying times and means that as long as you have acclimatised the tiles as stated for a minimum of 24 hours before laying, then you can start the fitting process straight away. This tape is made especially for us by a market leading brand name so you are guaranteed of a quality product. We normally carry over 150 rolls in stock at any one time so should have constant stock availability. 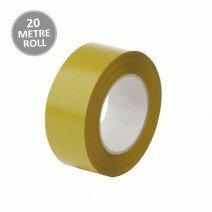 There is no minimum order for the double-sided tape and in fact have received orders in the past for just one roll. In this circumstance we can dispatch the parcel by using Royal Mail 1st Class post, meaning the product should usually get to you within 1-2 working days. When ordering with any of our carpet tiles or accessories then this will be sent out as a bundle on either DPD, FedEx or Palletways depending on the size of your order. This product is the ‘blue’ approved carpet tape meaning it is safe for use in exhibition centres. It has a permanent adhesive one side and a removable side on the reverse. This means that it is ideal for the temporary fixing of carpet tiles and also allows for clean removal if needs be in the future. Many exhibition centres and halls like the NEC in Birmingham ask for this as they have to ensure that floor goes back to its original condition upon vacation. They will have many exhibitions and events throughout the year requiring several different floor coverings all of which will need to be lifted again at the end of each show. Laying carpet tiles with double sided tape is by no means an exact science and many different ways of achieving the same result are possible. Whether you cut into small strips or lay long lengths on the floor will simply determine the amount of tape you actually need. When working out how many carpet tiles one roll will lay, we divided the 20 metre roll into 5 cm pieces (2” square bits) which meant you would get 20, 5 cm x 5 cm pieces per metre. As there are 20 metres per roll this meant approximately 400 pieces per roll was possible. If you then put one piece in every corner then you could easily fit 100 tiles. How you wish to do it is personal preference and we are giving the 100 tiles recommendation as a guide to what is achievable using just one of our rolls of double-sided tape. *Whilst this two strength adhesive is specially designed to be easily removed in the future we do not guarantee as such. Every application is different and we always advised customers to test in an inconspicuous area first. All customers must themselves determine whether this product is suitable for their needs and intended use before purchasing this product. All tapes no matter permanent or removable will leave some degree of residue on the floor, remember to test first on the exact surface you will be laying the carpet tiles onto.